The 3DS will now support Nintendo Network IDs, linking network services from the Wii U.
Nintendo has added support for Miiverse and changed the start-up method of the 3DS Camera in its system update 7.0.0-13U for the 3DS. The update should begin automatically if you performed the previous system update; if not, you can start the update from your 3DS's System Settings. Once the update has completed and the 3DS has restarted, Miiverse, the Nintendo social network, will be added to the top right of the bar on the 3DS's bottom screen, meaning you won't ever have to close your game to jump into Miiverse. 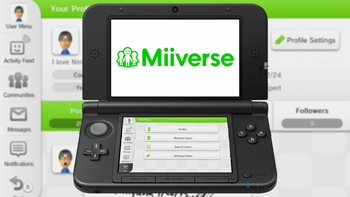 To access Miiverse, first you need to link your Nintendo Network ID if you have a Wii U or create a new one. If you already have a Wii U with a Nintendo Network ID, linking it to the 3DS will allow you to combine your eShop balances and Wish Lists. A Nintendo Network ID will now be required to download free content from the eShop. The firmware update also tweaked the start-up method of the Nintendo 3DS Camera. Previously, pressing L or R from the home menu opened the camera. Many users do this accidentally and have to wait for the camera to start up just to close it immediately. Pressing the L and R buttons simultaneously will now serve as the 3DS camera start-up method from the home menu, making it less likely to open the camera on accident. Another small but significant update was the change to the limit of system transfers, which allows you to transfer your data from one 3DS to another. A previous limit of five system transfers has been removed. Now there is no limit to the number of system transfers you can perform - a good move on Nintendo's part. This update is a goodie, and it should only take a short time to download.